Is Dispatch of CAN is mandatory by shipping company. What happens if buyer not known on arrival of exported goods? If the overseas buyer (importer) does not follow up the arrival of each shipment, the cargo arrives at destination un cleared. Even though, cargo arrival notice has to be sent by carrier of goods, the shipping line or freight forwarder may not do or may receive late. 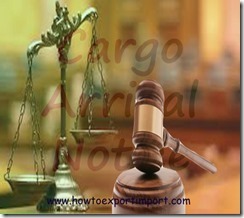 In many cases, the overseas buyer may not receive Cargo Arrival Notice from the carrier. Once cargo arrived at port of final destination, the cargo will be moved to nearest container freight station (for sea shipments) or airport authority handling point near airport. Remember, there are two demurrage falls under the said shipment if not cleared. The customs department may provide approval to auction the cargo, if not taken delivery within a stipulated period. Firstly, the warehousing demurrage charges at the container freight station or airport handling location. As you know, the area pertaining to handle international cargo is very expensive. The handling authorities provide free days to take delivery for a very limited day or days only. At most of the handling places is two or three days. Once after expiry of free days allowed to take delivery of imported goods, airport or seaport handling authorities charge demurrage. This demurrage accumulates very high, if the number of days increases. Secondly, in sea exports, if full container load (FCL ) cargo, the demurrage charges of shipping line is also applicable. This also accumulates in to higher amount when the number of days increases. Apart from both of the above, the major issue is the threat of auction of goods due to non filing of import documents with customs. If Bill of Entry is not filed within a stipulated period of time, customs can permit to action the un cleared cargo as per government rules. Bill of entry is the document filing with customs department to clear the import cargo. If bill of entry not filed within the allowed period, the cargo will be auctioned by the customs. However, proper intimation to be effected to importer with reminders before the said procedures are to be taken place. Because of no proper tracking of goods, there are many cases frequently happen that importer pays huge amount of demurrage to handling authorities and carriers of cargo apart from customs procedures. Here the question is whether an overseas buyer can sue against a carrier on non receipt of CAN cargo arrival notice. As per the rules and regulations of Carrier while issuing bill of lading or airway bill, dispatch of cargo arrival notice is not mandatory and thereby, the shipping carrier is not responsible for any loss or damage on non receipt of cargo arrival notice. So, the responsibility on tracking of arrival of goods is vested with the importer and shipping line can not be sued due to non receipt of cargo arrival notice. Also read How to get export order from foreign buyers? Haroonal Rasheed : On 19 February 2015 I am new comer into the field of Exim , i would like to seek a professional consultancy on one of my new venture. The details of the product is as follows, Prawn Feed / Shrimp Feed. Country of Origin - China Packing - 25 kg/ bullk Poly bag for reselling Port of destination - Chennai Payment terms yet to confirm .I have my TIN registered in Trichy Tamil Nadu, and i have a IEC from DGFT. I am also a member of the federation of Indian Exports . FIEO . I would like your provide me consultation for the import of the product and all the required documentation procedures. Difference between MBL and HBL. How does MBL work and How does HBL?